Savvy Spending: JCP: $10 off $25 coupon, in stores and online through 7/9! Plus, whopping 8% Cash Back!! 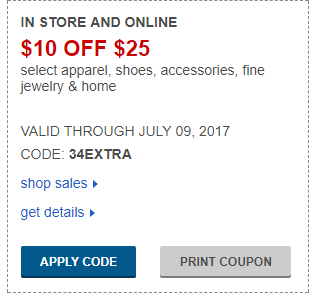 JCP: $10 off $25 coupon, in stores and online through 7/9! Plus, whopping 8% Cash Back!! JCP has another $10 off $25 coupon available to use online and in stores! Just use code 34EXTRA to save $10 off a $25 order or print the coupon here! Combine this with their Buy One, Get One for a Penny promo and you can get a great deal on lots of items! If you're shopping online, be sure to start at Top Cash Back for an extra 8% cash back! WOW!